Harvard Square sure has changed over the years, and it continues to change almost on a monthly basis, with old businesses in this bustling part of Cambridge constantly disappearing and new ones coming in. And it is interesting to see that a relatively new restaurant and pub with a familiar name has come to the area, though it is absolutely nothing like the long-closed spot that once held the name. Indeed, The Boathouse, which had been on JFK Street a number of years ago (where the Venezuelan restaurant Orinoco is now), was a bit of a meat market and a "fight a night" kind of bar that attracted a mix of Harvard students and locals from Cambridge and nearby communities. Well, now there is a place a few blocks away that is also called The Boathouse which is about the complete opposite, being a quiet, comfortable spot that offers good food and drink, and nary a fight to be had. The Boathouse is located in a relatively quiet part of Harvard Square with little foot traffic and some of the "easiest" (it's all relative, of course) parking in the neighborhood. The restaurant and bar sits next to Daedalus, a slightly upscale eatery that happens to have the same ownership, with The Boathouse in fact residing in the space where Trata--which had also been owned by the Daedalus folks--used to be. The space is small but attractive, with an S-shaped bar to the left, some high-top tables in front, and several booths along the wall to the right, with the booths following a short hall-like space that leads to a back exit. 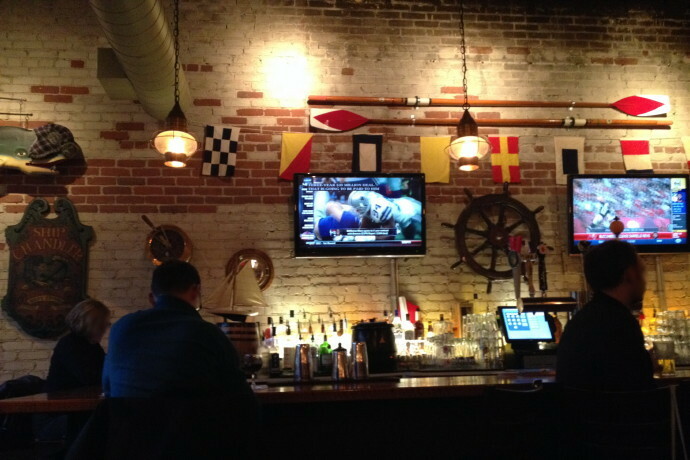 The interior has a rowing and maritime theme to it, with a racing shell hanging in the back, flags, ship wheels, and oars placed on the walls, and hanging lights that have a nautical feel to them, though the space also has a vaguely Irish feel as well, with the exterior certainly looking like that of an Irish pub. The menu at The Boathouse is relatively small but varied, with pub grub, New American dishes, Irish fare, and comfort food all offered. Some of the highlights include a plate of crispy popcorn chicken that comes with a smokey chipotle sauce; onion strings that have just the right level of greasiness to make them go perfectly with beer; a delicious Cuban sandwich with ham, pork loin, onions, pickles, Swiss cheese, and hot mustard on a toasted baguette; a hearty and very filling macaroni and cheese that has a mix of gruyere and cheddar cheeses and is topped with bread crumbs; an outstanding shepherd's pie made with rich-tasting ground lamb, mashed potatoes, carrots, roasted corn, peas, and gravy; tender and flaky fish and chips served with handcut fries and house-made cole slaw; and a decadent brownie sundae with caramel sauce. The beer list at The Boathouse includes a number of craft brews along with wines and cocktails, and the place also features all kinds of rum. While The Boathouse on Mt. Auburn Street is a whole different animal from the long-closed Boathouse on JFK Street, this isn't necessarily a bad thing, as this quiet little restaurant and bar is a pleasant, friendly, and mellow spot that is a rare hidden gem in the Harvard Square area. If you find yourself looking for a place to eat and/or drink and don't want to fight the crowds at the places in the main part of the square, this pub is a good option, indeed. Copyright © 2014, Boston's Hidden Restaurants (www.hiddenboston.com).